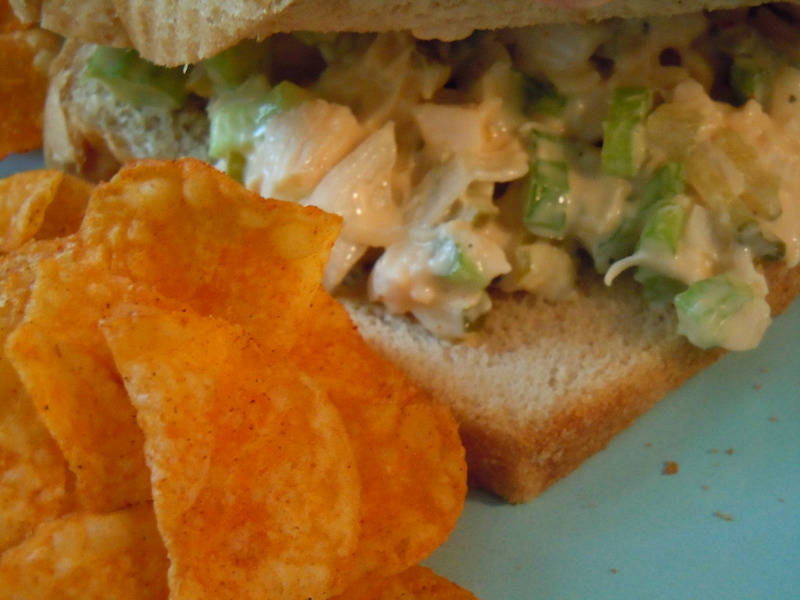 We frequently have tuna fish sandwiches for weekend lunches around here – a recipe I rarely stray from. But after my friend over at the Heart of a Country Home blog made Chicken Salad last week, I decided to give it a try this past weekend. I’ve made chicken salad before, not as often as tuna, but I don’t have a good recipe on file. I’m always changing it up. Here’s what I tried this time for a spicey mix. This was a good sandwich, very spicey. Celery tends to overpower things when it’s raw. The scent even lingers on your hands stronger than onion. So, I’d probably put just a little less celery and maybe a little more pickles. Or maybe even pimentos for something different and color? Instead of dill, I might even try sweet relish for a nice balance of sweet and hot. Either way, it was good and there were no leftovers. We served it with barbecue chips. But I will continue to perfect the chicken salad until it’s as good as my tuna!